More than 30,000 people will be removed from Louisiana's Medicaid program after a new verification system determined they likely made too much money to be eligible. In February, the Department of Health sent out 40,007 letters warning recipients that they could lose access to the taxpayer-funded health insurance program unless they could demonstrate that they still are eligible. As of Monday, 30,500 of those cases had been closed, said Robert Johannessen, communications director for LDH. This was not the first time program officials have used wage data from the Louisiana Workforce Commission to check eligibility, Johannessen noted. Income checks previously were done at application and renewal, so that the 40,007 people would have been notified over a 12-month period. "This was the first time that letters went to everyone who may have had excess income all at the same time," he said by email. More frequent income checks are one of the advantages touted by state officials of LaMEDS, an automated system that verifies income eligibility along with citizenship, disability and lawful presence in the country. The new system replaces inefficient manual processes for caseworkers with modern technologies and electronic data sources, the health department says. Last fall, the Louisiana Legislative Auditor reported the state's Medicaid program may have spent up to $85.5 million on behalf of ineligible enrollees. LaMEDS, which was already in the works at the time, was meant to address some of the issues the auditors raised. 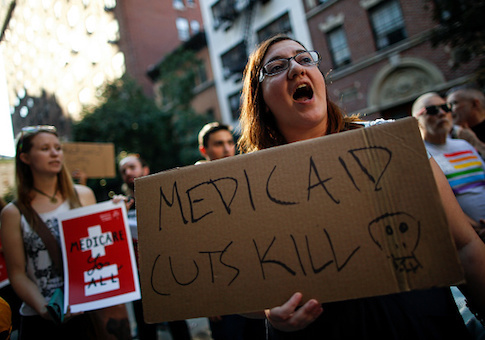 "The Department's process for determining Medicaid eligibility has been a very manual and time-consuming process based on income information provided by applicants," Dr. Rebekah Gee, the department's secretary, said at the time. "Effective today, and after more than three years of development, the Department has launched a new automated system for Medicaid eligibility and enrollment that will improve customer service, boost efficiency and increase the accuracy of eligibility decisions." This entry was posted in Issues and tagged Louisiana, Medicaid. Bookmark the permalink.